ONE Bank Limited job circular 2018. 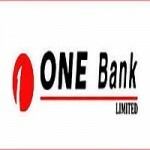 New vacancy Notice for ONE Bank Limited updated by there official website www.onebank.com.bd. Trainee Business Development Officer Job circular apply instruction & job details are given below. Candidate must have to apply ONE Bank Limited Job before 31 August 2018. There are lot`s of people searching for ONE Bank Limited job circular on google. In Bangladesh, job seeker want to build their Career in various company. ONE Bank Limited is an attractive company in Bangladesh. Student can apply this job deadline. Don`t wait to apply ONE Bank Limited Job if you are qualified. Job Requirements ONE Bank Limited Jobs Circular Notice for specific skills and work experience new worker in August 2018. Bachelor degree in any discipline Pass(Educational Qualification) Good knowledgeable candidate can apply this circular. Before apply Trainee Business Development Officer read this circular again or check specific skills, types and amounts of work experience, personal qualities,professional certifications, educational credentials or areas of knowledge.